Electoral College map showing the results of the 2012 U.S. presidential election. President Barack Obama (D-IL) won the popular vote in 26 states and the District of Columbia (denoted in blue) to capture 332 electoral votes. Former Governor Mitt Romney (R-MA) won the popular vote in 24 states (denoted in red) to capture 206 electoral votes. The United States Electoral College is the institution that officially elects the President and Vice President of the United States every four years. The President and Vice President are not elected directly by the voters. Instead, they are elected by "electors" who are chosen by popular vote on a state-by-state basis. Electors are apportioned to each state and the District of Columbia, but not to territorial possessions of the United States. The number of electors in each state is equal to the number of members of Congress to which the state is entitled, while the Twenty-third Amendment grants the District of Columbia the same number of electors as the least populous state, currently three. In total, there are 538 electors, corresponding to the 435 members of the House of Representatives, 100 senators, and the three additional electors from the District of Columbia. Electors are almost always pledged to particular presidential and vice presidential candidates, though unpledged electors are possible. Except for the electors in Maine and Nebraska, electors are elected on a "winner-take-all" basis. That is, all electors pledged to the presidential candidate who wins the most votes in a state become electors for that state. Maine and Nebraska use the "congressional district method", selecting one elector within each congressional district by popular vote and selecting the remaining two electors by a statewide popular vote. Although no elector is required by federal law to honor a pledge, there have only been very few occasions when an elector voted contrary to a pledge. The Twelfth Amendment, in specifying how a President and Vice President are elected, requires each elector to cast one vote for President and another vote for Vice President. The candidate that receives an absolute majority of electoral votes (currently 270) for the office of President or of Vice President is elected to that office. The Twelfth Amendment provides for what happens if the Electoral College fails to elect a President or Vice President. If no candidate receives a majority for President, then the House of Representatives will select the President, with each state delegation (instead of each Representative) having only one vote. If no candidate receives a majority for Vice President, then the Senate will select the Vice President, with each Senator having one vote. Critics argue that the Electoral College is inherently undemocratic and gives swing states disproportionate influence in electing the President and Vice President. 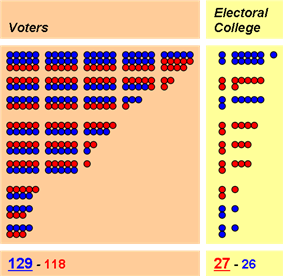 The Electoral College gives a numeric advantage in the election of the president to the smaller states, as the minimum number of electors for the small states is three compared to one for the election of representatives. On the other hand, the winner-take-all method of voting favors the larger states. On four occasions, most recently in 2000, the Electoral College system has resulted in the election of a candidate who did not receive the most popular votes in the election. A number of constitutional amendments have been proposed seeking to alter the Electoral College or replace it with a direct popular vote. The Convention approved the Committee's Electoral College proposal, with minor modifications, on September 6, 1787. Delegates from the small states generally favored the Electoral College out of concern that the large states would otherwise control presidential elections. Although the United States Constitution refers to "Electors" and "electors", neither the phrase "Electoral College" nor any other name is used to describe the electors collectively. It was not until the early 19th century that the name "Electoral College" came into general usage as the collective designation for the electors selected to cast votes for President and Vice President. It was first written into federal law in 1845 and today the term appears in 3 U.S.C. § 4, in the section heading and in the text as "college of electors." Article II, Section 1, Clause 3 of the Constitution provided for the original fashion by which the President and Vice President were to be chosen by the electors. In the original system, the candidate who received a majority of votes from the electors would become President; the candidate receiving the second most votes would become Vice President. On these facts, some scholars have described the Electoral College as being intended to nominate candidates from which the Congress would then select a President and Vice President. Each state government is free to have its own plan for selecting its electors, and the constitution does not require states to hold elections before choosing electors. Several different methods for selecting electors are described at length below. The emergence of political parties and nationally coordinated election campaigns soon complicated matters in the elections of 1796 and 1800. In 1796, Federalist Party candidate John Adams won the presidential election; by finishing in second place, Democratic-Republican Party candidate Thomas Jefferson, the Federalists' opponent, became the Vice President. This resulted in the President and Vice President not being of the same political party. In 1800, the Democratic-Republican Party again nominated Jefferson for President, and also nominated Aaron Burr for Vice President. After the election, Jefferson and Burr both obtained a majority of electoral votes, but tied one another with 73 votes each. Since ballots did not distinguish between votes for President and votes for Vice President, every ballot cast for Burr technically counted as a vote for him to become President, despite Jefferson clearly being his party's first choice. Lacking a clear winner by constitutional standards, the election had to be decided by the House of Representatives pursuant to the Constitution's contingency election provision. Having already lost the presidential contest, Federalist Party Representatives in the lame duck House session seized upon the opportunity to embarrass their opposition and attempted to elect Burr over Jefferson. The House deadlocked for 35 ballots as neither candidate received the necessary majority vote of the state delegations in the House (the votes of nine states were needed for an election). Jefferson achieved electoral victory on the 36th ballot, but only after Federalist Party leader Alexander Hamilton—who disfavored Burr's personal character more than Jefferson's policies—had made known his preference for Jefferson. Responding to the problems from those elections, the Congress proposed the Twelfth Amendment in 1803—prescribing electors cast separate ballots for President and Vice President—to replace the system outlined in Article II, Section 1, Clause 3. By June 1804, the states had ratified the amendment in time for the 1804 election. Section 2 of the Fourteenth Amendment allows for a state's representation in the House of Representatives to be reduced to the extent that state unconstitutionally denies people the right to vote. ^ Darrell J. Kozlowski (2010). Federalism. Infobase Publishing. pp. 33–34. ^ Since the U.S. Civil War, all the States have chosen Presidential electors by popular vote. This process has been normalized to the point that the names of the electors appear on the ballot only in a handful of states. ^ Morris, Irwin L. (2010). The American Presidency: An Analytical Approach. Cambridge University Press. p. 67. ^ Chang, Stanley (2007). "Updating the Electoral College: The National Popular Vote Legislation". Harvard Journal on Legislation (Cambridge, MA: President and Fellows of Harvard College) 44 (205, at 208). ^ Berg-Andersson, Richard E. (September 17, 2000). "What Are They All Doing, Anyway? : An Historical Analysis of the Electoral College". The Green Papers. ^ a b c "Senate Refuses To Halt Debate On Direct Voting". The New York Times. September 18, 1970. p. 1. ^ The Senate in 1975 reduced the required vote for cloture from two-thirds of those voting (66 votes) to three-fifths (60 votes). See United States Senate website. ^ Table 1. Annual Estimates of the Population for the United States, Regions, States, and Puerto Rico: April 1, 2010 to July 1, 2011 in State Totals: Vintage 2011, United States Census Bureau. ^ Sabrina Eaton (October 29, 2004). "Brown learns he can't serve as Kerry elector, steps down" (PDF). Cleveland Plain Dealer (reprint at Edison Research). Archived from the original on July 10, 2011. Retrieved January 3, 2008. ^ "Electoral College Instructions to State Officials". National Archives and Records Administration. Retrieved 22 January 2014. ^ "U.S.C. § 7 : US Code - Section 7: Meeting and vote of electors". ^ "U.S. Electoral College – For State Officials". National Archives and Records Administration. Retrieved November 7, 2012. ^ "Michigan Election Law Section 168.47". Legislature.mi.gov. Retrieved August 26, 2010. ^ David A. McKnight (1878). The Electoral System of the United States: A Critical and Historical Exposition of Its Fundamental Principles in the Constitution and the Acts and Proceedings of Congress Enforcing It. Wm. S. Hein Publishing. p. 313. ^ Longley, Lawrence D.; Pierce, Neal R. (1999). "The Electoral College Primer 2000". New Haven, CT: Yale University Press. p. 13. ^ "Election evolves into 'perfect' electoral storm". USA Today. December 12, 2000. Retrieved September 20, 2008. ^ "Apportionment of the U.S. House of Representatives Based on the 2010 Census" (PDF). Washington, D.C.: U.S. Census Bureau. December 21, 2010. Retrieved December 21, 2010. Each state's number of electoral votes is equal to its total congressional representation (its number of Representatives plus its two Senators). 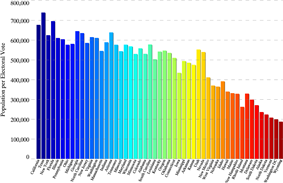 ^ "2010 Census: State Population and the Distribution of Electoral Votes and Representatives". thegreenpapers.com. ^ Moore, John L., ed. (1985). Congressional Quarterly's Guide to U.S. Elections (2nd ed.). Washington, D.C.: Congressional Quarterly, Inc. pp. 254–256. ^ a b c d Kolodny, Robin (1996). "The Several Elections of 1824". Congress & the Presidency (Washington, D.C.: American University) 23 (2). ^ "Election 101". Princeton Press. Princeton University Press. Retrieved 22 November 2014. ^ Black, Eric (14 October 2012). "Our Electoral College system is weird — and not in a good way". MinnPost. Retrieved 22 November 2014. ^ "Legislative Action?, The NewsHour with Jim Lehrer, November 30, 2000". Pbs.org. Retrieved August 26, 2010. ^ a b c "Fiddling with the Rules – Franklin & Marshall". Fandm.edu. March 9, 2005. Retrieved August 26, 2010. ^ "Election Reform". Dos.state.pa.us. Retrieved August 26, 2010. ^ Sabato, Larry. “A more perfect Constitution” viewed November 22, 2014. ^ Congressional Research Services Electoral College, p.15, viewed November 22, 2014. ^ "Articles – Upgrading The College". President Elect. September 5, 2004. Retrieved August 26, 2010. ^ a b Molai, Nabil (October 28, 2008). "Republicans Push to Change Electoral Vote System". KPTM Fox 42. Retrieved November 4, 2008. ^ Kleeb, Jane (March 10, 2011). "Fail: Sen. McCoy's Partisan Electoral College Bill". Bold Nebraska. Retrieved August 9, 2011. ^ Jacobson, Louis (31 January 2013). "The Ramifications of Changing the Electoral College". Governing Magazine. Retrieved 22 November 2014. ^ Wilson, Reid (17 December 2012). "The GOP's Electoral College Scheme". National Journal. Retrieved 22 November 2014. ^ Bugh, Gary E. 2010. “Representation in Congressional Efforts to Amend the Presidential Election System.” In Electoral College Reform: Challenges and Possibilities, ed. Gary E. Bugh. Burlington, VT: Ashgate Publishers, 5–18. ^ a b c d e f g Edwards III, George C. (2011). Why the Electoral College is Bad for America (Second edition ed.). New Haven and London: Yale University Press. pp. 1, 37, 61, 176–7, 193–4. ^ "The trouble with the Electoral College". C.G.P. Grey. Retrieved October 29, 2012. ^ a b Nivola, Pietro (January 2005). "Thinking About Political Polarization" (139). Brookings Institution Policy Brief. ^ Koza et al., John (2006). "Every Vote Equal: A State-Based Plan for Electing the President by National Popular Vote". p. xvii. ^ a b Amar, Akhil; Amar, Vikram (September 9, 2004). "The Electoral College Votes Against Equality". Los Angeles Times. ^ Gelman, Andrew; Katz, Jonathan; Tuerlinckx, Francis (2002). "The Mathematics and Statistics of Voting Power". Statistical Science 17 (4): 420–435. ^ Jerry Fresia (February 28, 2006). "Third Parties?". Zmag.org. Retrieved August 26, 2010. ^ "Why the Electoral College, P. Andrew Sandlin, December 13, 2000". Lewrockwell.com. December 13, 2000. Retrieved August 26, 2010. ^ a b Kimberling, William C. (May 1992). "The Electoral College" (PDF). ^ Sabato, Larry (2007). A More Perfect Constitution (First U.S. ed.). Walker Publishing Company. ^ "The Electoral College: Bulwark Against Fraud". Psych.cornell.edu. Retrieved August 26, 2010. ^ "Myths about Recounts". National Popular Vote. ^ Neale, Thomas H. Electoral College Reform Congressional Research Service p.21-22, viewed November 23, 2014. ^ "About Governor Blagojevich's signing of HB 1685". Nationalpopularvote.com. Retrieved August 26, 2010. ^ "About veto override in Hawaii". Nationalpopularvote.com. Retrieved August 26, 2010. ^ "History of Bill". Apps.leg.wa.gov. Retrieved August 26, 2010. ^ Leblanc, Steve (August 4, 2010). "Mass. gov. signs national popular vote bill". The Seattle Times. Retrieved August 26, 2010. ^ "Council of the District (Search for B18-0769)". Council of the District of Columbia. 2009. Retrieved December 21, 2010. ^ "Vermont Is Eighth State to Enact National Popular Vote Bill". BusinessWire. April 22, 2011. Retrieved April 22, 2011. The first state to join the Compact was Maryland, when Governor Martin O'Malley signed the bill into law on April 10, 2007. New Jersey joined on January 13, 2008, despite objections from Republicans who criticized the bill as undermining federal elections. Illinois passed the law on April 7, 2008. Hawaii joined on May 1, when the legislature overrode a veto from Governor Linda Lingle. On April 28, 2009, the State of Washington joined, when Governor Christine Gregoire signed HB 1598. Massachusetts joined the compact on August 4, 2010, when Governor Deval Patrick signed that state's bill into law. Additionally, the District of Columbia, which has three electoral votes, joined the compact on December 7, 2010. Vermont joined the compact on April 22, 2011, when Governor Peter Shumlin signed that state's bill into law. On August 8, 2011, California joined when Governor Jerry Brown signed a bill adding California to the compact. The Compact is based on the current rule in Article II, Section 1, Clause 2 of the Constitution that gives each state legislature the plenary power to determine how it chooses its electors, though some have suggested that Article I, Section 10, Clause 3 of the Constitution requires congressional consent before the Compact could be enforcible. Under the proposed National Popular Vote Interstate Compact, individual states pledge their electors to the winner of the national popular vote. The Compact will not go into effect until a sufficient number of states agree to the Compact such that a majority (at least 270) of all electors are pledged to the winner of the national popular vote. This would effectively establish a direct election of the President without amending the Constitution. As of 2014, 10 states and the District of Columbia have joined the compact; collectively, these jurisdictions control 165 electoral votes, which is 61% of the 270 required for the Compact to take effect. Some supporters of the Electoral College note that it isolates the impact of any election fraud, or other such problems, to the state where it occurs. It prevents instances where a party dominant in one state may dishonestly inflate the votes for a candidate and thereby affect the election outcome. For instance, recounts occur only on a state-by-state basis, not nationwide. Critics of the current system suggest that the results in a single state – such as Florida in 2000 – can decide the national election and thus not keep any problems in such a state isolated from the rest of the nation. According to this argument, the fact that the electoral college is made up of real people instead of mere numbers allows for human judgment and flexibility to make a decision, if it happens that a candidate dies or becomes legally disabled around the time of the election. Advocates of the current system argue that human electors would be in a better position to choose a suitable replacement than the general voting public. According to this view, electors could act decisively during the critical time interval between when ballot choices become fixed in state ballots until mid-December when the electors formally cast their ballots. In the election of 1872, losing Democratic candidate Horace Greeley died during this time interval which resulted in Democratic disarray, but the Greeley electors were able to split their votes for different alternate candidates. A situation in which the winning candidate died has never happened. In the election of 1912, Vice President Sherman died shortly before the election when it was too late for states to remove his name from their ballots; accordingly, Sherman was listed posthumously, but the eight electoral votes that Sherman would have received were cast instead for Nicholas Murray Butler. Many proponents of the Electoral College see its negative effect on third parties as beneficial. They argue that the two party system has provided stability because it encourages a delayed adjustment during times of rapid political and cultural change. They believe it protects the most powerful office in the country from control by what these proponents view as regional minorities until they can moderate their views to win broad, long-term support across the nation. Advocates of a national popular vote for president suggest that this effect would also be true in popular vote elections. Of 918 elections for governor between 1948 and 2009, for example, more than 90% were won by candidates securing more than 50% of the vote, and none have been won with less than 35% of the vote. The United States of America is a federal coalition which consists of component states. Proponents of the current system argue that the collective opinion of even a small state merits attention at the federal level greater than that given to a small, though numerically equivalent, portion of a very populous state. The system also allows each state the freedom, within constitutional bounds, to design its own laws on voting and enfranchisement without an undue incentive to maximize the number of votes cast. Proponents of the Electoral College claim the Electoral College prevents a candidate from winning the Presidency by simply winning in heavily populated urban areas. This means that candidates must make a wider geographic appeal than they would if they simply had to win the national popular vote. In practice, the winner-take-all manner of allocating a state's electors generally decreases the importance of minor parties. However, it has been argued that the electoral college is not a cause of the two-party system, and that it had a tendency to improve the chances of third-party candidates in some situations. As a consequence of giving more per capita voting power to the less populated states, the Electoral College gives extra power to voters in those states. In one countervailing analysis about smaller states gaining an Electoral College advantage, the Banzhaf power index (BPI) model based on probability theory was used to test the hypothesis that citizens of small states accrue more election power. It was found that in 1990, individual voters in California, the largest state, had 3.3 times more individual power to choose a President than voters of Montana, the largest of the minimum 3 elector states. Banzhaf's method has been criticized for treating votes like coin-flips, and more empirically based models of voting yield results which seem to favor larger states less. Territorial possessions of the United States, such as Puerto Rico and Guam, are not entitled to any electors in presidential elections. Constitutionally, only U.S. states (per Article II, Section 1, Clause 2) and Washington, D.C. (per the Twenty-third Amendment) are entitled to any electors. Guam has held non-binding straw polls for president since the 1980s to draw attention to this fact. This has also led to various scholars concluding that the U.S. national-electoral process is not fully democratic. The founders' system also encouraged the continued disfranchisement of women. In a direct national election system, any state that gave women the vote would automatically have doubled its national clout. Under the Electoral College, however, a state had no such incentive to increase the franchise; as with slaves, what mattered was how many women lived in a state, not how many were empowered ... a state with low voter turnout gets precisely the same number of electoral votes as if it had a high turnout. By contrast, a well-designed direct election system could spur states to get out the vote. According to this criticism, the electoral college reduces elections to a mere count of electors for a particular state, and, as a result, it obscures any voting problems within a particular state. For example, if a particular state blocks some groups from voting, perhaps by voter suppression methods such as imposing reading tests, poll taxes, registration requirements, or legally disfranchising specific minority groups, then voting inside that state would be reduced. But the state's electoral count would be the same. So disenfranchisement has no effect on the overall electoral tally. Critics contend that such disenfranchisement is partially obscured by the Electoral College. A related argument is that the Electoral College may have a dampening effect on voter turnout: there is no incentive for states to reach out to more of its citizens to include them in elections because the state's electoral count remains fixed in any event. According to this view, if elections were by popular vote, then states would be motivated to include more citizens in elections since the state would then have more political clout nationally. Critics contend that the electoral college system insulates states from negative publicity as well as possible federal penalties for disenfranching subgroups of citizens. A result of the present functionality of the Electoral College is that the national popular vote bears no legal or factual significance on determining the outcome of the election. Since the national popular vote is irrelevant, both voters and candidates are assumed to base their campaign strategies around the existence of the Electoral College; any close race has candidates campaigning to maximize electoral votes by capturing coveted swing states, not to maximize national popular vote totals. Scenarios exhibiting this outcome typically result when the winning candidate has won the requisite configuration of states (and thus their votes) by small margins, but the losing candidate captured large voter margins in the remaining states. In this case, the very large margins secured by the losing candidate in the other states would aggregate to well over 50 percent of the ballots cast nationally. In a two-candidate race, with equal voter turnout in every district and no faithless electors, a candidate could win the electoral college while winning only about 22% of the nationwide popular vote. This would require the candidate in question to win each one of the following states by just one vote: Alabama, Alaska, Arizona, Arkansas, Colorado, Connecticut, Delaware, District of Columbia, Hawaii, Idaho, Indiana, Iowa, Kansas, Kentucky, Louisiana, Maine, Maryland, Massachusetts, Minnesota, Mississippi, Missouri, Montana, Nebraska, Nevada, New Hampshire, New Jersey, New Mexico, North Dakota, Oklahoma, Oregon, Rhode Island, South Carolina, South Dakota, Tennessee, Utah, Vermont, Virginia, West Virginia, Wisconsin, and Wyoming. Opponents of the Electoral College claim that such outcomes do not logically follow the normative concept of how a democratic system should function. One view is that the Electoral College violates the principle of political equality, since presidential elections are not decided by the one-person one-vote principle. Outcomes of this sort are attributable to the federal nature of the system. From such a configuration, argue supporters of the Electoral College, candidates must build a popular base that is geographically broader and more diverse in voter interests. This feature is not a logical consequence of having intermediate elections of Presidents, but rather the winner-takes-all method of allocating each state's slate of electors. Allocation of electors in proportion to the state's popular vote could reduce this effect. The elections of  In 1824, there were six states in which electors were legislatively appointed, rather than popularly elected, so the true national popular vote is uncertain. When no candidate received a majority of electoral votes in 1824, the election was decided by the House of Representatives and so could be considered distinct from the latter three elections in which all of the states had popular selection of electors. A bar graph of popular votes in presidential elections, with blue stars marking the four elections in which the winner did not have the plurality of the popular vote. Black squares mark the cases where the electoral vote resulted in a tie, or the winner did not have the majority of electoral votes. An 'H' marks the two cases where the election was decided by the House, and an 'S' marks the one case where the election was finalized by the Supreme Court. This graphic demonstrates how the winner of the popular vote can still lose in a hypothetical electoral college system. Arguments between proponents and opponents of the current electoral system include four separate but related topics: indirect election, disproportionate voting power by some states, the winner-takes-all distribution method (as chosen by 48 of the 50 states), and federalism. Arguments against the Electoral College in common discussion mostly focus on the allocation of the voting power among the states. Gary Bugh’s research of congressional debates over proposed Electoral College amendments reveals that reform opponents have often appealed to a traditional version of representation, whereas reform advocates have tended to reference a more democratic view. In 2010, Republicans in Pennsylvania, who controlled both houses of the legislature as well as the governorship, put forward a plan to change the state's winner-takes-all system to a Congressional district method system. Pennsylvania had voted for the Democratic candidate in the five previous presidential elections, so many saw this as an attempt to take away Democratic electoral votes. Although Democrat Barack Obama won Pennsylvania in 2008, he only won a minority of the state's congressional districts. The plan later lost support. Other Republicans, including Michigan state representative Pete Lund, RNC Chairman Reince Priebus, and Wisconsin Governor Scott Walker, have floated similar ideas. The Congressional District Method allows a state the chance to split its electoral votes between multiple candidates. Before 2008, neither Maine nor Nebraska had ever split their electoral votes. Nebraska split its electoral votes for the first time in 2008, giving John McCain its statewide electors and those of two congressional districts, while Barack Obama won the electoral vote of Nebraska's 2nd congressional district. Following the 2008 split, some Nebraska Republicans made efforts to discard the Congressional District Method and return to the winner-takes-all system. In January 2010, a bill was introduced in the Nebraska legislature to revert to a winner-take-all system; the bill died in committee in March 2011. Republicans had also passed bills in 1995 and 1997 to eliminate the Congressional District Method in Nebraska, but those bills were vetoed by Democratic Governor Ben Nelson. Of the 43 states whose electoral votes could be affected by the Congressional District Method, only Maine and Nebraska apply it. Maine has four electoral votes, based on its two Representatives and two Senators. Nebraska has two Senators and three Representatives, giving it five electoral votes. Maine began using the Congressional District Method in the election of 1972. Nebraska has used the Congressional District Method since the election of 1992. Since the 1830s, the only other state to use the system is Michigan, which only used the system for the 1892 presidential election. Unlike simple congressional district comparisons, the District Plan popular vote bonus in the 2008 election would have given Obama 56% of the Electoral College versus the 68% he did win, it "would have more closely approximated the percentage of the popular vote won [53%]." The Congressional District Method can more easily be implemented than other alternatives to the winner-takes-all method. State legislation is sufficient to use this method. Advocates of the Congressional District Method believe the system would encourage higher voter turnout and incentivize presidential candidates to broaden their campaigns in non-competitive states. Winner-take-all systems ignore thousands of popular votes; in Democratic California there are Republican districts, in Republican Texas there are Democratic districts. Because candidates have an incentive to campaign in competitive districts, with a district plan, candidates have an incentive to actively campaign in over thirty states versus seven “swing” states. Opponents of the system, however, argue that candidates might only spend time in certain battleground districts instead of the entire state and cases of gerrymandering could become exacerbated as political parties attempt to draw as many safe districts as they can. There are two versions of the Congressional District Method: one has been implemented in Maine and Nebraska; another that has been proposed in Virginia. Under the implemented Congressional District Method, the electoral votes are distributed based on the popular vote winner within each of the state’s congressional districts; the statewide popular vote winner receives two additional electoral votes. Another method used early in U.S. history was to divide the state into electoral districts. By this method, voters in each district would cast their ballots for the candidate they supported and the winner in each district would receive that electoral vote. This was similar to how states are currently separated by congressional districts. However, the difference stems from the fact that every state always had two more electoral districts than congressional districts. As with congressional districts, moreover, this method is vulnerable to gerrymandering. In 1864, Nevada, having joined the Union only a few days prior to Election Day, had no choice but to appoint. In 1868, the newly reconstructed state of Florida appointed its electors, having been readmitted too late to hold elections. Finally, in 1876, the legislature of the newly admitted state of Colorado used legislative choice due to a lack of time and money to hold an election. In the earliest presidential elections, state legislative choice was the most common method of choosing electors. A majority of the states selected presidential electors by legislation in both 1792 (9 of 15) and 1800 (10 of 16), and half of the states did so in 1812. Even in the 1824 election, a quarter of states (6 of 24) chose electors by legislation. In that election, Andrew Jackson lost in spite of having pluralities of both the popular and electoral votes, with the outcome being decided by the six state legislatures choosing the electors. Some state legislatures simply chose electors, while other states used a hybrid method in which state legislatures chose from a group of electors elected by popular vote. By 1828, with the rise of Jacksonian democracy, only Delaware and South Carolina used legislative choice. Delaware ended its practice the following election (1832), while South Carolina continued using the method until it seceded from the Union in December 1860. South Carolina used the popular vote for the first time in the 1868 election. The question of the extent to which state constitutions may constrain the legislature's choice of a method of choosing electors has been touched on in two U.S. Supreme Court cases. 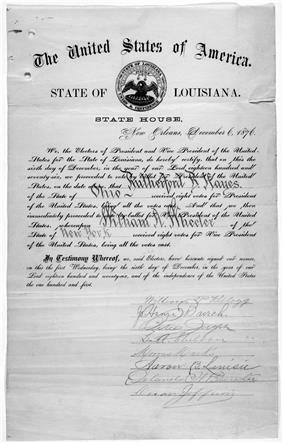 In McPherson v. Blacker, 146 U.S. 1 (1892), the Court cited Article II, Section 1, Clause 2 which states that a state's electors are selected "in such manner as the legislature thereof may direct" and wrote that these words "operat[e] as a limitation upon the state in respect of any attempt to circumscribe the legislative power." In Bush v. Palm Beach County Canvassing Board, 531 U.S. 70 (2000), a Florida Supreme Court decision was vacated (not reversed) based on McPherson. On the other hand, three dissenting justices in Bush v. Gore, 531 U.S. 98 (2000), wrote: "nothing in Article II of the Federal Constitution frees the state legislature from the constraints in the State Constitution that created it." Number of electors from each state for the 2004 and 2008 Presidential Elections. 12 electoral votes changed between 18 states, based on the 2010 census. Eight states lost one electoral vote and two (New York & Ohio) each lost two electoral votes. Eight states gained electoral votes, six gained one electoral vote, Florida gained two & Texas gained four. The following is a list of electoral votes by state. * Washington, D.C., although not a state, is granted the same number of electoral votes as the least populous state (which has always been 3) by the Twenty-third Amendment. ** Maine and Nebraska electors distributed by way of the Congressional District Method. The following table shows the number of electoral votes (EV) to which each state and the District of Columbia will be entitled during the 2012, 2016 and 2020 presidential elections: The numbers in parentheses represent the number of electoral votes that a state gained (+) or lost (-) because of reapportionment following the 2010 Census. If the House of Representatives has not chosen a President-elect in time for the inauguration (noon on January 20), then Section 3 of the Twentieth Amendment specifies that the Vice President-elect becomes Acting President until the House selects a President. If the winner of the vice presidential election is also not known by then, then under the Presidential Succession Act of 1947, the sitting Speaker of the House would become Acting President until either the House selects a President or the Senate selects a Vice President. None of these situations has ever occurred. The only time the Senate chose the Vice President was in 1837. In that instance, the Senate adopted an alphabetical roll call and voting aloud. The rules further stated, "[I]f a majority of the number of Senators shall vote for either the said Richard M. Johnson or Francis Granger, he shall be declared by the presiding officer of the Senate constitutionally elected Vice President of the United States..." (Johnson won). Additionally, the Twelfth Amendment states that a "majority of the whole number" of Senators (currently 51 of 100) is necessary for election. Further, the language requiring an absolute majority of Senate votes precludes the sitting Vice President from breaking any tie which might occur, although this is disputed by some legal scholars. If no candidate for Vice President receives an absolute majority of electoral votes, then the Senate must go into session to elect a Vice President. The Senate is limited to choosing from only the top two candidates to have received electoral votes (one fewer than the number to which the House is limited). The Senate votes in the normal manner in this case (i.e., ballots are individually cast by each Senator, not by state delegations). However, two-thirds of the Senators must be present for voting to take place. After the certificates from all States are read and the respective votes are counted, the presiding officer simply announces the final result of the vote and, provided that the required absolute majority of votes was achieved, declares the names of the persons elected President and Vice President. This announcement concludes the joint session and formalizes the recognition of the President-elect and of the Vice President-elect. The Senators then depart from the House Chamber. The final tally is printed in the Senate and House journals. Objections to the electoral vote count are rarely raised, although it did occur during the vote count in 2001 after the close 2000 presidential election between Governor George W. Bush of Texas and the Vice President of the United States, Al Gore. Vice President Gore, who as Vice President was required to preside over his own Electoral College defeat (by five electoral votes), denied the objections, all of which were raised only by several House members and would have favored his candidacy, after no Senators would agree to jointly object. Objections were again raised in the vote count of the 2004 elections, and on that occasion the document was presented by one Representative and one Senator. Although the joint session was suspended, the objections were quickly disposed of and rejected by both Houses of Congress. If there are no objections or all objections are overruled, the presiding officer simply includes a State's votes, as declared in the certificate of vote, in the official tally. Members of Congress can object to any state's vote count, provided that the objection is presented in writing and is signed by at least one member of each house of Congress. An objection supported by at least one Senator and one Representative will be followed by the suspension of the joint session and by separate debates and votes in each House of Congress; after both Houses deliberate on the objection, the joint session is resumed. A State's certificate of vote can be rejected only if both Houses of Congress vote to accept the objection. In that case, the votes from the State in question are simply ignored. The votes of Arkansas and Louisiana were rejected in the presidential election of 1872. The meeting is held at 1:00 pm in the Chamber of the U.S. House of Representatives. The sitting Vice President is expected to preside, but in several cases the President pro tempore of the Senate has chaired the proceedings instead. The Vice President and the Speaker of the House sit at the podium, with the Vice President in the seat of the Speaker of the House. Senate pages bring in the two mahogany boxes containing each state's certified vote and place them on tables in front of the Senators and Representatives. Each house appoints two tellers to count the vote (normally one member of each political party). Relevant portions of the Certificate of Vote are read for each state, in alphabetical order. The Twelfth Amendment mandates that the Congress assemble in joint session to count the electoral votes and declare the winners of the election. The session is ordinarily required to take place on January 6 in the calendar year immediately following the meetings of the presidential electors. Since the Twentieth Amendment, the newly elected House declares the winner of the election; all elections before 1936 were determined by the outgoing House instead. Faithless electors have not changed the outcome of any presidential election to date. For example, in George W. Bush received a majority (271) of the electoral votes. As electoral slates are typically chosen by the political party or the party's presidential nominee, electors usually have high loyalty to the party and its candidate: a faithless elector runs a greater risk of party censure than criminal charges. A faithless elector is one who casts an electoral vote for someone other than the person pledged or does not vote for any person. 24 states have laws to punish faithless electors. In 1952, the constitutionality of state pledge laws was brought before the Supreme Court in Ray v. Blair, 343 U.S. 214 (1952). The Court ruled in favor of state laws requiring electors to pledge to vote for the winning candidate, as well as removing electors who refuse to pledge. As stated in the ruling, electors are acting as a functionary of the state, not the federal government. Therefore, states have the right to govern electors. The constitutionality of state laws punishing electors for actually casting a faithless vote, rather than refusing to pledge, has never been decided by the Supreme Court. While many only punish a faithless elector after-the-fact, states like Michigan also specify that the faithless elector's vote be voided. A staff member of the President of the Senate collects the Certificates of Vote as they arrive and prepares them for the joint session of the Congress. The Certificates are arranged—unopened—in alphabetical order and placed in two special mahogany boxes. Alabama through Missouri (including the District of Columbia) are placed in one box and Montana through Wyoming are placed in the other box. Although procedures in each state vary slightly, the electors generally follow a similar series of steps, and the Congress has constitutional authority to regulate the procedures the states follow. The meeting is opened by the election certification official—often that state's secretary of state or equivalent—who reads the Certificate of Ascertainment. This document sets forth who was chosen to cast the electoral votes. Each elector present answers to his name, and any vacancies are noted in writing. The next step is the selection of a president or chairman of the meeting, sometimes also with a vice chairman. The electors sometimes choose a secretary, often not himself an elector, to take the minutes of the meeting. In many states, political officials give short speeches at this point in the proceedings. The Electoral College never actually meets as one body. Electors chosen on Election Day meet in their respective state capitals (or in the case of the District of Columbia, within the District) on the Monday after the second Wednesday in December, at which time they cast their electoral votes on separate ballots for President and Vice President. After the election each state prepares seven Certificates of Ascertainment, each listing the candidates for President and Vice President, their pledged electors, and the total votes each candidacy received. One certificate is sent, as soon after Election Day as practicable, to the National Archivist in Washington D.C. The Certificates of Ascertainment are mandated to carry the State Seal, and the signature of the Governor (in the case of the District of Columbia, the Certificate is signed by the Mayor of D.C.). The current system of choosing electors is called the "short ballot." In most states, voters choose a slate of electors, and only a few states list on the ballot the names of proposed electors. In some states, if a voter wants to write in a candidate for President, the voter is also required to write in the names of proposed electors. The Tuesday following the first Monday in November has been fixed as the day for holding federal elections, called the Election Day. Forty eight states and Washington, D.C., employ the "winner-takes-all method", each awarding its electors as a single bloc. Maine and Nebraska use the "congressional district method", selecting one elector within each congressional district by popular vote and selecting the remaining two electors by a statewide popular vote. This method has been used in Maine since 1972 and in Nebraska since 1996. Candidates for elector are nominated by their state political parties in the months prior to Election Day. In some states, the electors are nominated in primaries, the same way that other candidates are nominated. In some states, such as Oklahoma, Virginia and North Carolina, electors are nominated in party conventions. In Pennsylvania, the campaign committee of each candidate names their candidates for elector (an attempt to discourage faithless electors). Article II, Section 1, Clause 2 of the Constitution requires each state legislature to determine how electors for the state are to be chosen, but it disqualifies any person holding a federal office, either elected or appointed, from being an elector. Under Section 3 of the Fourteenth Amendment, any person who has sworn an oath to support the United States Constitution in order to hold either a state or federal office, and later rebelled against the United States, is disqualified from being an elector. However, the Congress may remove this disqualification by a two-thirds vote in each House. Currently, there is a total of 538 electors, there being 435 representatives and 100 senators, plus the three electors allocated to Washington, D.C.. The six states with the most electors are California (55), Texas (38), New York (29), Florida (29), Illinois (20) and Pennsylvania (20). The seven smallest states by population—Alaska, Delaware, Montana, North Dakota, South Dakota, Vermont, and Wyoming—have three electors each. This is because each of these states are entitled to one representative and two senators. Under the Twenty-third Amendment, Washington, D.C. is allocated as many electors as it would have if it were a state, but no more electors than the least populous state. The least populous state (which is Wyoming according to the 2010 Census) has three electors; thus, D.C. cannot have more than three electors. Even if D.C. were a state, its population would entitle it to only three electors; based on its population per electoral vote, D.C. has the second highest per-capita Electoral College representation, after Wyoming. A state's number of electors equals the number of representatives and senators the state has in the United States Congress. In the case of representatives, this is based on the respective populations. Each state's number of representatives is determined every 10 years by the United States Census. In the case of senators, each state is entitled to two. State population per electoral vote for the 50 states and Washington D.C.
A candidate must receive an absolute majority of electoral votes (currently 270) to win the Presidency or the Vice Presidency. If no candidate receives a majority in the election for President and/or Vice President, that election is determined via a contingency procedure established by the Twelfth Amendment. In such a situation, the House chooses one of the top three presidential electoral vote-winners as the President, while the Senate chooses one of the top three vice presidential electoral vote-winners as Vice President. The indirectly elect the President, as the national popular vote is not the basis for electing the President or Vice President. Open debate on the proposal in the Senate commenced on September 8, 1970 and was quickly subjected to a filibuster. The lead objectors to the proposal were mostly Southern Senators and conservatives from small states, both Democrats and Republicans, who argued abolishing the Electoral College would reduce their states' political influence. On September 17, 1970, a motion for cloture, which would have ended the filibuster, received 54 votes to 36 for cloture, failing to receive the then required two-thirds majority of Senators voting. A second motion for cloture on September 29, 1970 also failed, by 53 to 34. Thereafter, the Senate Majority Leader, Mike Mansfield of Montana, moved to lay the proposal aside so that the Senate could attend to other business. However, the proposal was never considered again and died when the 91st Congress ended on January 3, 1971. On August 14, 1970, the Senate Judiciary Committee sent its report advocating passage of the proposal to the full Senate. The Judiciary Committee had approved the proposal by a vote of 11 to 6. The six members who opposed the plan, Democratic Senators James Eastland of Mississippi, John Little McClellan of Arkansas and Sam Ervin of North Carolina along with Republican Senators Roman Hruska of Nebraska, Hiram Fong of Hawaii and Strom Thurmond of South Carolina, all argued that although the present system had potential loopholes, it had worked well throughout the years. Senator Bayh indicated that supporters of the measure were about a dozen votes shy from the 67 needed for the proposal to pass the full Senate. He called upon President Nixon to attempt to persuade undecided Republican Senators to support the proposal. However, Nixon, while not reneging on his previous endorsement, chose not to make any further personal appeals to back the proposal. On October 8, 1969, the New York Times reported that 30 state legislatures were "either certain or likely to approve a constitutional amendment embodying the direct election plan if it passes its final Congressional test in the Senate." Ratification of 38 state legislatures would have been needed for adoption. The paper also reported that 6 other states had yet to state a preference, 6 were leaning toward opposition and 8 were solidly opposed. On September 30, 1969, President Richard Nixon gave his endorsement for adoption of the proposal, encouraging the Senate to pass its version of the proposal which had been sponsored as Senate Joint Resolution 1 by Senator Birch Bayh (D – Indiana). Representative Emanuel Celler (D – New York), Chairman of the House Judiciary Committee, responded to public concerns over the disparity between the popular vote and electoral vote by introducing House Joint Resolution 681, a proposed Constitutional amendment which would have replaced the Electoral College with simpler plurality system based on the national popular vote. With this system, the pair of candidates who had received the highest number of votes would win the Presidency and Vice Presidency providing they won at least 40% of the national popular vote. If no pair received 40% of the popular vote, a runoff election would be held in which the choice of President and Vice President would be made from the two pairs of persons who had received the highest number of votes in the first election. The word "pair" was defined as "two persons who shall have consented to the joining of their names as candidates for the offices of President and Vice President."